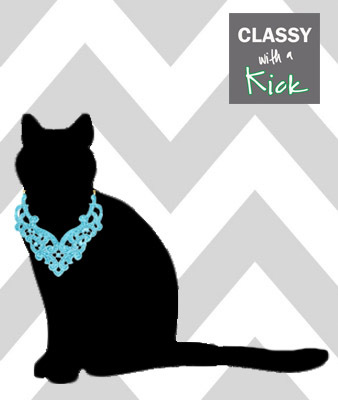 Classy with a Kick: The cat's out of the bag and wearing a lace necklace! Don't worry, I feel like you aren't alone, I kept my blog for a secret as well! Still loving your necklaces!! Thanks Amy! It was fun as a secret but it's still fun now. I am amazed at how many people actually do that! Most people in my life don't know about my blog either other than my parents, sister, and hubby. I think having the cat out of the bag is a good thing because it will totally help grow your business! Yeah, I see that happening once people find out. :) Love your blog...I am a new follower! Thank you for stopping by my blog and commenting! I appreciate it and am glad I'm following you!